Does Hands-Free Driving Hinder Safety? 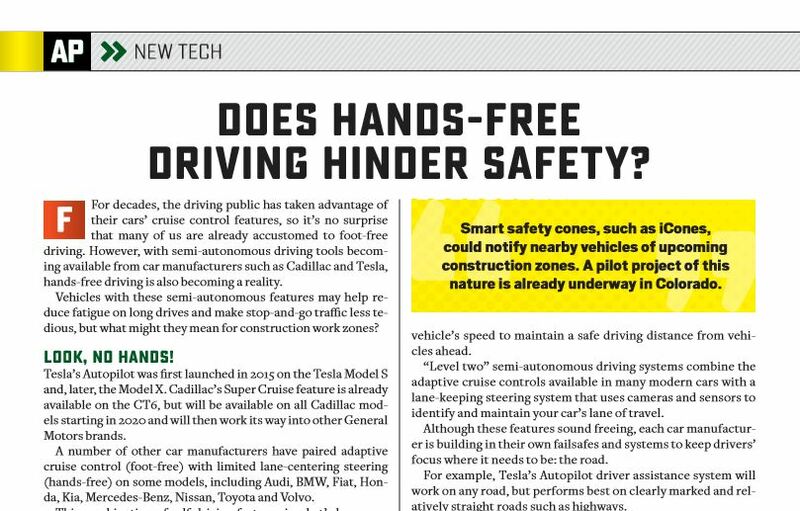 | AsphaltPro Magazine | Does Hands-Free Driving Hinder Safety? Does Hands-Free Driving Hinder Safety? For decades, the driving public has taken advantage of their cars’ cruise control features, so it’s no surprise that many of us are already accustomed to foot-free driving. However, with semi-autonomous driving tools becoming available from car manufacturers such as Cadillac and Tesla, hands-free driving is also becoming a reality. Vehicles with these semi-autonomous features may help reduce fatigue on long drives and make stop-and-go traffic less tedious, but what might they mean for construction work zones? Tesla’s Autopilot was first launched in 2015 on the Tesla Model S and, later, the Model X. Cadillac’s Super Cruise feature is already available on the CT6, but will be available on all Cadillac models starting in 2020 and will then work its way into other General Motors brands. A number of other car manufacturers have paired adaptive cruise control (foot-free) with limited lane-centering steering (hands-free) on some models, including Audi, BMW, Fiat, Honda, Kia, Mercedes-Benz, Nissan, Toyota and Volvo. This combination of self-driving features is what’s known as level two automation, according to the Society of Automotive Engineers International (SAE International). Level one combines a human driver and an autonomous system. We see this in our cars’ traditional foot-free cruise control capabilities. Level two leaves the responsibility of both acceleration/deceleration and steering to the autonomous system. That’s where features like Autopilot and Super Cruise are today. In both level one and level two autonomous systems, the human driver is responsible for monitoring the driving environment and driving in the event that the autonomous system fails or cannot perform within certain circumstances. However, the National Highway Transportation and Safety Administration estimates that 80 percent of all accidents are due to distracted driving. With the prevalence of distracted driving, will drivers, given the luxury of hands- and foot-free driving, pay the attention required to identify an upcoming work zone and behave appropriately? Cruise control has been around for decades, but in the early 2000s car companies began offering adaptive cruise control systems in their vehicles, which would automatically adjust the vehicle’s speed to maintain a safe driving distance from vehicles ahead. “Level two” semi-autonomous driving systems combine the adaptive cruise controls available in many modern cars with a lane-keeping steering system that uses cameras and sensors to identify and maintain your car’s lane of travel. Although these features sound freeing, each car manufacturer is building in their own failsafes and systems to keep drivers’ focus where it needs to be: the road. For example, Tesla’s Autopilot driver assistance system will work on any road, but performs best on clearly marked and relatively straight roads such as highways. It also requires the driver’s hands on the steering wheel for Autopilot to operate. If the driver takes their hands off the wheel for more than 30 seconds, a reminder will sound for the driver to return his or her hands to the wheel. If the driver doesn’t do so, Autopilot will be disabled for the rest of the drive. On the other hand, Cadillac’s Super Cruise doesn’t require drivers to keep their hands on the wheel, but it does use a set of sensors on the steering column to ensure drivers keep their eyes straight ahead. If the sensors register that the driver’s head and/or eyes are not directed to the road, the system will sound several warnings and eventually cancel Super Cruise and slowly bring the car to a stop. Super Cruise also only works on highways that have been mapped by Cadillac, totaling more than 130,000 miles of interstates in the U.S. and Canada. Aug. 25, 2018, a Tesla Model S crashed into a stopped firetruck. It was the third instance where a Tesla crashed into a firetruck while supposedly on Autopilot. Tesla is not alone in this challenge. For example, Volvo warns in its manuals that if a car ahead of a vehicle with Pilot Assist enabled changes lanes or turns off the road, Pilot Assist will not only ignore the stationary vehicle, but may even speed up if the adaptive cruise control was traveling at a slower speed than the one the driver had previously set. This is, of course, cause for concern in the road construction industry, where slow-moving and stopped equipment–and crew members–are often only feet from passing motorists. If drivers have so much trust in semi-autonomous driving features–so much so that they aren’t paying enough attention to see a big, red firetruck–will they see a flagger? Although a November 2017 update to Autopilot’s software was discovered to be able to recognize construction zones, the car manual warns against using the feature in this and other instances. Cadillac goes one step further and aims to disable the Super Cruise feature automatically, prompting the driver to take over when the vehicle enters a work zone. However, ensuring the vehicle knows it’s about to enter a work zone is not yet streamlined. Currently, Cadillac reaches out to states and municipalities directly to identify active work zones along its 130,000 miles of Super Cruise-approved roads. In the future, Cadillac’s database of work zones will be updated automatically through the use of vehicle-to-everything (V2X) communication, in which vehicles can share information with other vehicles and the environment. For example, smart safety cones, such as iCones, could notify nearby vehicles of upcoming construction zones. A pilot project of this nature is already underway in Colorado. It’s possible that fully autonomous vehicles will one day make our work zones even safer, as they are forced to obey reduced speed limits and pay full attention to their surroundings. However, that is still a ways off. For the time being, it should be common sense that drivers should not use cruise control or hands-free steering in construction zones. However, there are already numerous videos of drivers whose cars are equipped with these semi-autonomous features putting them to the test in construction zones. Common sense does not always win. We may soon be able to drive without our feet or our hands, but we should never drive without our brains. Inset: Consumer Reports’ first-ever ranking of automated driving systems ranked Cadillac Super Cruise as the best system available today, followed by Tesla’s Autopilot, then Nissan’s ProPilot Assist.